To that end, New Orleanians must elect a judicial candidate that is smart, compassionate, and above all experienced, because judgeships aren’t simply about the person seeking the bench; rather, judicial elections are about identifying a person prepared to use their legal acumen in the service of the public at large. Judgeships are about everyday people finding remedy to their disputes and being made whole in their times of need. Judgeships are about identifying which candidate can invoke confidence in the litigants, attorneys, and the community that they are prepared to understand the law and apply it fairly. Through diligence and hard work, I am the only candidate in this race with the substantive experience that warrants your trust, support, and your vote. 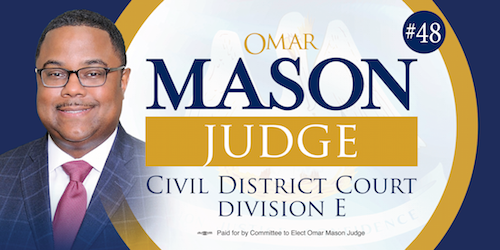 Consequently, it is with great humility, enthusiasm, and preparedness that I ask my fellow New Orleanians for their vote on December 8th to serve our community as the next Judge of Civil District Court, Division E.
For generations, New Orleans has relied on fair-minded, experienced judges to interpret laws equitably. The realities of the current political climate of our country makes one thing clear, with respect to who should be elected judge—New Orleans needs an experienced servant leader on the bench. I’ve amassed nineteen years as a litigator and have represented clients on both sides of the civil docket. My nineteen year practices includes complex litigation, general litigation matters, and civil family disputes. The candidate qualified for this judgeship needs to have the type of experience that I have worked hard to obtain. As judge, I pledge to use my preparedness and vast legal experiences to ensure that attorneys are held accountable to the legal standards of our profession, while ensuring that the people in my courtroom are treated with the fairness and dignity they deserve. I am honored to have been given a vote of confidence by my peers in the legal community as the winner of the New Orleans Bar Association Lawyer’s Poll which depicts who they believe is best qualified to serve as a strong judge. When local attorneys were polled on this election, 52% said I was most qualified to serve as judge, while only 2% said my opponent was the right person for this seat. Lastly, I sincerely want the voters of New Orleans to know that servant leadership is not a new trait I hope to embody as a member of the judiciary. Rather, I have been entrenched in our community as a proven community servant. As a national leader of the Knight of Peter Claver Catholic Organization, Chair of the Federal Bar Association’s Philanthropy Committee, and Past President of Alpha Phi Alpha Fraternity, Inc.’s local graduate chapter, I’ve worked tirelessly to impact our city. If elected to the bench, serving our communities with the same vigor I’ve demonstrated previously will be a top priority. New Orleans, I am a proud husband, father, and experienced attorney. I’m asking for your prayers, support, and your vote. I’ll be a judge that doesn’t just sit on the bench, but one who stands up for our communities and makes you proud. New Orleans deserves nothing less! I would be honored to have your vote December 8.